If ever a river proved the wisdom of wild trout management it is the South Fork of the Boise River. Here is a place only 60 miles from Boise, one of the West's fastest growing urban centers with more than 130,000 people. No other waters within 140 miles of Idaho's capital city have even close the quality of fishery and therefore the heavy load of fishing pressure. Only 10 miles is easily accessible, focusing the pressure along this short stretch. However, the South Fork of the Boise is the Timex of Idaho trout streams. It takes a licking and keeps on ticking like a fine time piece. Year in and year out the South Fork offers a quality fishery to thousands of anglers from Idaho and beyond. The reason is fishermen simply leave the fish in the river for the next person. In 1978 anglers caught 19,150 rainbows, Idaho Department of Fish and Game fisheries biologists estimate. They released 18,059, about 94 percent. In 1988, they caught 18,400 trout and released 18,216, or 99 percent. The regulations allow fishermen to keep two trout under 12 inches or above 20 inches. They just don't. The South Fork's productivity ultimately goes back to its geology. Much of the southwestern mountain country of Idaho is sterile batholith, a granite-based rock formation older than 50 million years. Rivers running through this rock, such as the Payette, are far less productive than those that run through the rich volcanic basalts of the Snake River Plain. The Boise has drainages in the batholith. But the South Fork lies on the edge of the Snake River Plain providing needed minerals for its rich insect hatches. The South Fork's other secret is winter flows. The Anderson Ranch Dam holds back waters necessary for irrigation throughout the arid Boise River Valley. Yet despite the pressures of irrigation farmers, the Bureau of Reclamation keeps the winter flows from the dam above 300 cubic feet per second. This more than enough to provide trout with necessary holding pools and habitat to ensure winter survival. This is a tail race fishery that offers better trout rearing and living conditions than if the dam wasn't there. If all federal dams were operated with as much care for the fish as Anderson Ranch, fishing conditions would improve handsomely throughout the West. During the summer season flows rise to more than 3,000 cubic feet per second during the runoff. When its so high, the ability of waders to fish the most productive waters starting about two miles down from the dam, is hampered. But dam operators bring the flows down to around 1,500 cfs as soon as possible because the access water can't be harassed for hydroelectricity production. At 1,500, waders have full run of the first 10 miles. Late in the season, when the irrigation season ends and the flows are dropped below 1,000 floating becomes difficult but the fishing really turns on. Fish and Game and the U.S. Forest Service, which controls the land along the river, have attempted to limit the number of boats, primarily by prohibiting outfitting. This hasn't prevented some illegal outfitting but it has made the South Fork harder for a visiting fisherman to learn quickly. However, this is a fishing worth the trip to Boise in itself. The fish are not as large as their cousins in the Silver Creek or the Henry's Fork. They also aren't as hard to catch. A fisher can have regular action from 12 to 15-inch fish throughout the season. How many places can an angler fly a major airline into a metropolitan area, rent a car, drive an hour and find himself fishing a quiet stretch of river deep in a desert river canyon. Or how about the businessman who has a meeting with one of Boise's corporate headquarters in the morning. He can fish the afternoon and evening, catch a flight around 9 p.m. and be home before midnight. Boise fly fishermen have been leaving work early and catching the evening caddis hatches for years. But even Sun Valley fishers make the 130-mile trip to the South Fork despite having to drive past Silver Creek and the Wood River to get there. 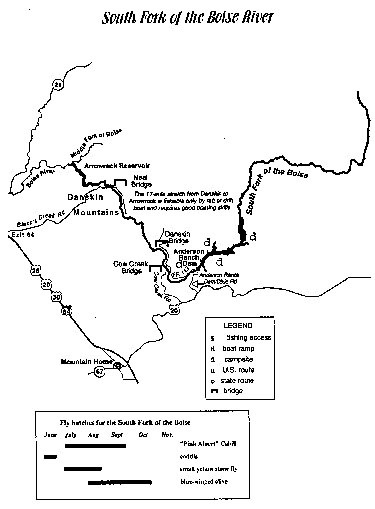 To get to the south Fork from Boise, fishers must drive south on Interstate 84 35 miles to Mountain Home's second exit on Highway 20. Turn east or left on Highway 20 and drive 20 miles to the Anderson Ranch Dam-Dixie Road and turn north or left. An eight-mile drive down into the canyon takes fishermen to Forest Road 113. Turn left or west and for the next 10 miles the road follows the river, providing access all along it to the Danskin Bridge. Seven miles downriver is the Cow Creek Road, which also runs into Highway 20 about 10 miles west of Anderson Ranch Dam road. However, this dirt road takes a little longer time because the driving slower and the road, true to its name often is full of cows. The 17-mile stretch below Danskin is only fishable by drift boat or raft and it takes good boating skills to float it. It runs through a large, deserted canyon and empties into Arrowrock Reservoir. The Take out is on Black's Creek Road, which is reached by taking Exit 64 of Highway 84 south of Boise. Check with the Boise National Forest to ensure the water level is high enough to navigate. The first two miles below the dam the river runs a little fast through the canyon into a wider cottonwood-lined free stone stream. Another two miles down the river opens up into a meadow stretch that runs for another two miles. From the Cow Creek bridge to Danskin it straightens and widens again. The South Fork of the Boise has a unique mayfly hatch, the "Pink Albert" Cahill. Known scientifically as Epeorus albertea, the Pink Albert comes off on the river throughout the day from July through September. The Pink Albert fly is tied primarily in a size 14 and 16 and is a must fly selection of the South Fork angler. In June, caddis flies are the major hatches but an occasional early small yellow stone fly will work. These stone flies come off in July and August. A Yellow Sally pattern, in 12 to 16 works well. From August through October, blue wings olive baetis hatches carry the angler into the late season. A mountain whitefish season is open during the winter, when trout are to be released. Since most fishermen release all trout anyway there is little different. March Brown nymphs are popular among these whitefish anglers. Prince nymphs and Hare's Ear nymphs also can be effective when the hatches turn off. A stimulator in 16 or 14 also is deadly. rbarker@srv.net Order 10 or more at $20 each and we'll pay for shipping.